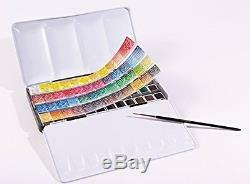 Sennelier - French Watercolour Metal Set Of 48 Half Pans. The Sennelier 48 Half Pan Watercolor set is inspired by the bright and lively palette of Southern France. Each set contains top quality French Artists Watercolor, a travel brush and built in palette within a compact and sturdy metal case. Reformulated with an increased honey content fives each watercolor incomparable brilliance and luminosity while acting as a preservative to extend the paints longevity. SENNELIER French Artists WC Pocket Metal Set of 48 Half Pan. Colors used by the Impressionists - housed in a beautiful case. The choice of most reknown artists in the world. Best Artist quality Watercolors on the market. If you happen to be local, please drop by and see us if you'd like. We are located at 42 Bridge Street Benalla, Vic, 3672. So come on in and browse our selection of art supplies, crafts, stationary, and books. We are sure you will find something that invites your inner artist to come out and play! Be sure to stop by regularly to take advantage of our sales and specials that will help you save even more off of our everyday low prices. List, Sign up for our newsletters. All products will be packaged to make sure they are safe for travel, and sent off via AusPost. We reserve the right to alter information at any time without notice. Art and Frames can't be held responsible for loss or damage of any kind, costs, third party claims resulting from the use of any product or information provided on this site. It is your responsibility to gather additional information on the use of a product, therefore we are not liable for injuries or health issues resulting directly or indirectly from any product use. Our policy lasts 30 days. To be eligible for a return, your item must be unused and in the same condition that you received it. It must also be in the original packaging. We also do not accept products that are intimate or sanitary goods, hazardous materials, or flammable liquids or gases. Additional non-returnable items: Gift cards. Any item not in its original condition, is damaged or missing parts for reasons not due to our error. Exchanges We only replace items if they are defective or damaged. Depending on where you live, the time it may take for your exchanged product to reach you, may vary. We pride ourselves on our feedback and believe all issues can be resolved. "The best compliment we can get from our customers is the word-of-mouth recommendation and the referral of your friends, family members and colleagues". The item "Sennelier French Watercolour Metal Set Of 48 Half Pans" is in sale since Thursday, June 30, 2016. This item is in the category "Crafts\Art Supplies\Painting Supplies\Paint\Watercolour Paint". The seller is "carlisleartau" and is located in Benalla, Vic, 3672.